At least 30 Manchester United supporters in Nigeria have been killed while watching the team's Europa League game last night after a live electrical wire fell on a packed bar. Nigerian police say the fans were killed while watching the Europa League game between United and Anderlecht in the city of Calabar. More than 80 people had been crammed inside the bar to watch the match. 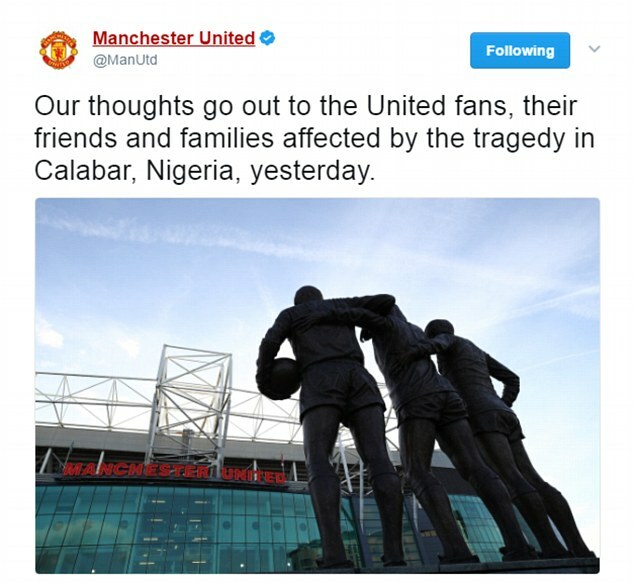 In a tweet today, Manchester United said the team's thoughts went out to those affected by the tragedy. 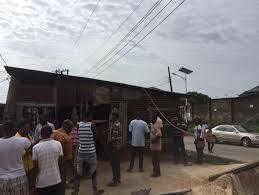 The Port Harcourt Electricity Distribution Company has not commented on the incident, but authorities have said it is illegal to erect structures under high-tension cables. 'It was heart-wrenching that the lives of the young men were lost through electrocution,' the state's governor, Ben Ayade, said in a statement. Many Nigerians prefer to watch football games at the viewing centers, for a small fee, instead of watching at home. A witness told Nigerian television he had been one of the first to escape after realizing there was a problem. He said: 'I was sitting at the front seats when I saw the reflection form the transformer. The News Agency of Nigeria reported there more than 20 deaths, although local police gave a lower estimate.